Midwestern movie house owner Virgil Wander is "cruising along at medium altitude" when his car flies off the road into icy Lake Superior. Virgil survives but his language and memory are altered and he emerges into a world no longer familiar to him. the Pea family, whose various members must confront tragedies of their own. Into this community returns a shimmering prodigal son who may hold the key to reviving their town. With intelligent humor and captivating whimsy, Leif Enger conjures a remarkable portrait of a region and its residents, who, for reasons of choice or circumstance, never made it out of their defunct industrial district. Since his teens, Leif Enger has wanted to write fiction. He worked as a reporter and producer for Minnesota Public Radio from 1984 until the sale of Peace Like a River to publisher Grove/Atlantic allowed him to take time off to write. In the early 1990s, he and his older brother, Lin, writing under the pen name L.L. Enger, produced a series of mystery novels featuring a retired baseball player. Peace Like a River, published in 2001, has been described as "high-spirited and unflagging" and has received some notable acclaim in literary circles. His second novel, So Brave, Young, and Handsome is the story of an aging train robber's quest for self-discovery. Published in 2008, it received has excellent reviews. 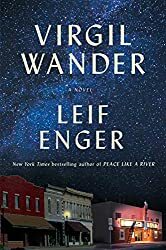 In 2018 Enger released Virgil Wander, a midwestern twist on magical realism about a town—and its inhabitants—struggling for a new lease on life. Enger’s first novel in 10 years marks him as a foremost stylist. His prose is rhapsodic, kaleidoscopic and — I’ll say it — enviable. Even more enviable is the rare feat of writing a comedic literary novel that is also a page-turner. He’s performing on a trapeze that not many others have even reached for.… Enger deserves to be mentioned alongside the likes of Richard Russo and Thomas McGuane. Virgil Wander is a lush crowd-pleaser about meaning and second chances and magic. The well-meaning sad sack who narrates this poignant novel …has just driven his car into icy Lake Superior when the book opens.… Enger’s novel gives magical realism a homely Midwestern twist, and should have very broad appeal. (Starred review) The focus of [Enger’s] bright and breathing third novel feels mostly like life itself, in all its smallness and bigness, and what it means to live a good one. [A] magical mystery tour of a fictional town on the shores of Lake Superior, near Duluth. [Enger's] first novel in a decade—perhaps his most ambitious. Or at least his most overstuffed.